This past year, the 5th Bowmanville Group welcomed more than 13 new youth and more are still joining. For their Group Commissioner, Terri Strawn, that is no coincidence, it’s all about a Youth-led program and kids having fun. Terri was kind enough to share with ScoutingLife how the Group has been able to attract so many new members and deliver such a great program. The Group could not have reached its amazing 118.2% increase in membership without all the Scouters working towards the same goal and delivering a consistent program. “At the 5th, we have developed a philosophy of play-based learning that is youth-centred and Youth-led. Our mission as a Group is to teach the youth skills, while they are enjoying themselves and giving back to the community,” said Terri. Over the last two years, the Group has been offering a program focused on the youth not only learning life skills — including safety and awareness of the environment — but also focused on having a lot of fun and unique adventures. The Group has learned that those with positive experiences tend to go out and tell others about the program which in turn stimulates requests for a visit to their Colony, parental involvement and excellent bring a friend nights. From community service projects to geocaching activities, the 5th Bowmanville Group stays active in its community which helps the youth develop well-rounded individuals better prepared for success. 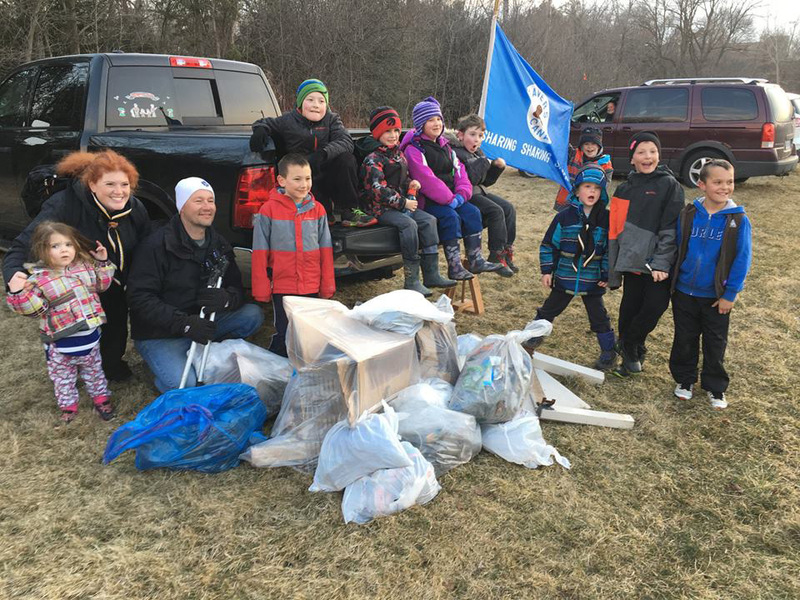 “The Group has organized multiple community clean-ups including one last year that cleaned up over 60 lbs of garbage in less than 1 hour. Cards to veterans were also a hit and stimulated discussions about contributions to society as a whole,” said Terri. Some of the other activities planned by the Group include: designing and making bottle rockets; scientific experiments including Mentos and volcano eruptions; geocached hidden treasures during the Halloween hike, movie nights and tent sleepovers at the church; a paddling adventure at camp and participation in the Fort George Brigade Camp in Niagara on the Lake. With many exciting and unique activities coupled with a Youth-led program, it’s no wonder that the 5th Bowmanville Group is able to recruit so many new youth and Scouters. Also, they have a bat symbol on their crest, and who wouldn’t want to be a part of a Group with a cool and innovative crest? !